New American cuisine at an elegant restaurant with water views. 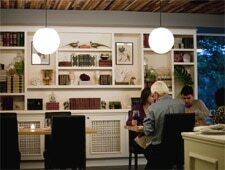 : Tucked away near the Fremont Bridge, this elegant restaurant comes with waterfront views. Chef Shaun McCrain --- whose credentials include Les Élysées du Vernet in Paris, Michael Mina in San Francisco, and four years at Thomas Keller’s Per Se in New York --- serves New American cuisine. The dining room, refined and understated with marble and light wood tables, is romantically lit and lined with bookshelves containing vintage volumes. The front of the room faces the ship canal, while a window at the back looks into the barrel room of the adjacent Almquist Family winery, the restaurant's owners. Starters have included a foie gras terrine and crispy sweetbreads. Entrées range from herb-roasted sturgeon with potato gnocchi and bacon marmalade to a duo of rabbit, or rack of lamb with merguez sausage. Desserts are simple, perhaps with a twist on a classic like s’mores with smoked marshmallows. Service is skilled, but needs moderating with some Seattle casualness and warmth. The small wine list is well chosen and offers, at a very small mark-up, bottles from Almquist Family winery.